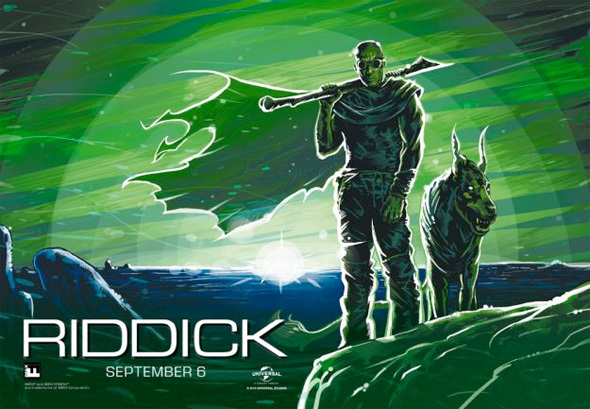 Following their giveaway of posters for Star Trek Into Darkness and Pacific Rim, IMAX will keep giving sci-fi fans goodies to display on their wall with the release of Universal's sequel Riddick next week. As part of IMAX's FanFix program, the sci-fi film starring Vin Diesel will be giving away an exclusive poster to fans who attend the first IMAX showings of the film, many of which will be happening at 8pm on September 5th. Fans will get the poster designed by Alex Fuentes while supplies last, and if you want to make sure you'll get one at your screening, you can find the full list of theaters giving them away right here. Look now!